Note: NYTimes Cooking used to be available without charge to anyone who wanted to use it, but as of now, October 20, 2018, you either have to subscribe to it as a stand-alone feature or subscribe to the NYTimes. As a long-time reader of the NYTimes, I find NYTimes Cooking to be a treasure trove of recipes, and I enthusiastically recommend it to anyone willing to listen. The site is user-friendly; it's easy to save recipes, print recipes, share recipes, and email recipes. Since its inception I have added a number of its recipes to my own repertoire. But when I was perfecting a recipe for Eggplant Parmesan based on Melissa Clark's Parmigiana Dishes to Warm Weary Souls, I decided to try the tomato sauce she recommends, her Simple Tomato Sauce. This is now the sauce I use for Eggplant Parmesan, which is a great recipe for a dinner party as you can do all the heavy lifting ahead. For this Simple Tomato Sauce I like to use two 28-ounce cans of Italian tomatoes in puree with the letters DOP on the label, which in English means Protected Designation of Origin. There is some controversy about whether or not this designation indicates superior tomatoes or not; I find them to be good, but you might want to read what Serious Eats has to say on the matter. Put the tomatoes in a large bowl and crush them using your fingers. Do not do this in a blender or food processor as it will make them too fine. If the tomatoes have been packed with basil leaves, remove and discard them. 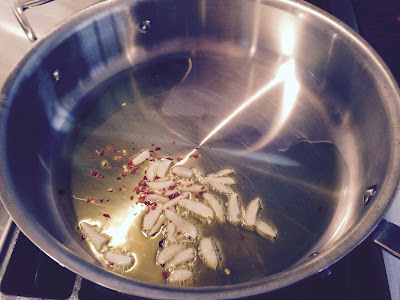 Warm the oil in a 4-quart non-reactive sauté pan, and add the garlic slices. Cook until the slices turn slightly/barely gold; watch carefully, don't let them color too much or burn. If you do, you have to start over. Add the crushed red pepper flakes, and cook for 30 seconds. Stir in the contents of the bowl with the crushed tomatoes, add the basil if you are using it and the salt and pepper. Bring sauce to a simmer, and taste to check the seasoning. Add a little more salt if necessary. Cook at a steady simmer, adjusting the heat as necessary, until the tomatoes have thickened into a sauce that is not at all watery, but not jammy either. This will take about 30 to 40 minutes. Remove from the heat and discard the basil if you used it. If you are using this sauce to make Eggplant Parmesan, let it cool to room temperature before proceeding with layering the ingredients.